Cream the Rabbit (Japanese: クリーム・ザ・ラビット, Kurīmu za Rabitto) is a recurring character in the Sonic the Hedgehog games and related media. Introduced to the Sonic series in 2002 as hidden artwork in Sonic Mega Collection, Cream debuted for real as a playable character in Sonic Advance 2. A young rabbit with a polite manner and a perpetually sunny outlook, Cream is followed almost everywhere by her pet Chao, Cheese. Prototype sketches for Cream showing some alternate designs. More prototype sketches, with some of Cream's potential forms being a kitten, a jerboa, a tanuki/common raccoon, and a squirrel. During the development of Sonic Heroes, Sonic Team needed several new characters to fill out the 12-man playable roster. Along with a resurrected Team Chaotix, E-123 Omega and Cream were designed specifically for a Heroes role, with the big-eared rabbit to serve as the flight member for Team Rose. 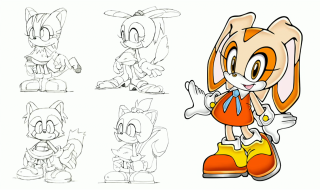 However, with Sonic Advance 2 being developed in parallel, an opportunity existed to introduce Cream to the franchise earlier, so players would already be familiar with her by the time that the main series Heroes title was launched - rather than being confronted with two entirely new characters at once. As such, Cream's first playable appearance came in December 2002: 14 months before the release of the game for which she was actually devised. This had the added advantage of establishing Cream in the games before television, as she was to appear in the first episode of Sonic X in March 2003. Cream is amongst the youngest of the Sonic characters, and still retains a childish naïveté which influences her interactions with other members of the cast. 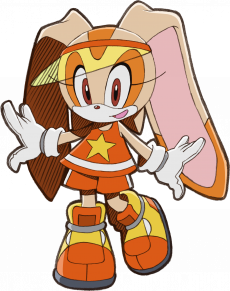 She's also one of the few animal protagonists to have any relatives in the games: her mother, Vanilla the Rabbit, who's raised Cream to be unfailingly polite and kind to others - even Dr. Eggman, despite being kidnapped by him (twice). At times, Cream is to Amy Rose what Tails is to Sonic: the younger and slightly awe-struck sidekick. While Cream's innocence and enthusiasm endears her to most of the other characters, it can occasionally get on the nerves of some of her more serious comrades - notably Blaze the Cat in Sonic Rush. Although Cream can fight to help out her friends out on their mutual adventures, she dislikes violence in general and would prefer never to have to get antagonistic with anyone. Nevertheless, she has a variety of useful abilities, including the ability to fly by flapping her oversized ears. In Sonic Advance 2 and Sonic Advance 3, Cream's greatest asset in a fight is Cheese; her Chao Attack alone is a complete game-changer, as Cheese can demolish badniks at range, on demand, and with no danger. This makes most bosses trivially easy as well. Sonic Mega Collection (as artwork); Sonic Advance 2; Sonic Advance 3; Sonic Adventure DX: Director's Cut; Sonic Battle; Sonic Heroes; Shadow the Hedgehog; Sonic and the Secret Rings; Sonic Riders; Sonic Riders: Zero Gravity; Sonic Free Riders; Sonic Rush; Sonic Chronicles: The Dark Brotherhood; Sonic Colours (Nintendo DS); Sonic Generations (HD); Sonic Runners. In the cutscene before True Area 53, Eggman captures Vanilla (along with a bunch of flickies) and takes her to space in an Egg Capsule - a development with which Cream is understandably upset. After Sonic (somehow) saves her mother from going splat after orbital re-entry, she and Cream share a tearful reunion. Sonic runs off before listening to anything they might have to say again. Cream was retroactively added into Sonic Adventure for the remake and its digital re-releases. She will make a single appearance at a certain point in each character's story where she will fly around Station Square, and appears on a billboard in Mystic Ruins after the game is completed. A member of Team Rose along with Big and Amy, Cream spends Sonic Heroes searching for Cheese's twin, a Chao called Chocola. It transpires that Neo Metal Sonic has kidnapped the chao - along with Froggy - to extract the secret of Chaos Zero's transformative abilities. Cream's repertoire of skills includes Thunder Shoot and Chao Attack, as well as the Flower Festival Team Blast. Even though it's her first time teaming up with Amy, Cream is quick to learn that it's best not to challenge the pink hedgehog's delusions about Sonic - backing quite quickly out of a conversation to that effect in Casino Park. Cream is not a mission companion character in Shadow the Hedgehog, but does appear as the Hero mission objective for Shadow and Amy in Cryptic Castle. Amy reports that - rather unwisely - Cream just wandered off into Eggman's foreboding fortress, and asks Shadow to help find her. Somehow the rabbit has gotten herself stuck behind a fake wall, and lost Cheese deeper in the castle. If Shadow chooses to keep on with the Hero route, the Chao can be discovered hidden behind a giant moving wall, imprisoned with a load of other Chao. In Sonic Battle, Cream seems to be living at Amy's apartment in Central City. The rabbit's aversion to boxercise leaves Amy speculating that "She's been acting wierd lately. Maybe she's just going through some changes", but eventually Cream and Cheese are roped in to helping train Emerl. After Amy leaves the robot with Cream so she can go buy dieting equipment she saw on an infomercial, Dr. Eggman bursts in with Chaos Gamma and the E-121 Phis to kidnap them. Cream's story is the sixth of eight, and is spent almost entirely inside Gimme Shelter, Eggman's base under Night Babylon. Eggman plans to use Cream and Cheese as hostages in a trap for Sonic, but after Emerl teaches Cream that violence really is the answer to life's problems, they all attack Chaos Gamma and escape. After completing the third Act of Cyber Track in Sonic Advance 3, Cream descends from the sky with a voluminous parasol, much to the heroes' surprise. Cream confides that she was "out for a walk with Cheese" but just got lost, so the protagonists lead her out to a less deadly strolling route, after which she becomes a playable character. When Cream is taken as a partner character, she enables a variety of of flying team moves. Her combination with Amy is her only named partnership: the pair of them form Team Jubilee. Cream's Tag Action is perhaps the most interesting in the game: Cheese shape-shifts to resemble Sonic, Tails, Knuckles, or Amy, and grants that character the ability to use Chao Attack themselves. Although Cream - and everyone else - fails to recognise Gemerl as a rebuild of Emerl, it is her and Vanilla who find the robot in the game's end sequence, and take him to Tails' Workshop for repair. In the final scene, Cream is shown playing with the ostensibly reformed Gizoid. Cream is included in Party Mode for Sonic and the Secret Rings, but has no role in the game's story. Cream puts a sad look on her face to startle opponents, making them lose their balance. Cream calls on her sidekick Cheese to come out and attack a nearby opponent, knocking them off balance. Cream calls on her sidekick Cheese to come out and pester a nearby opponent, distracting them and knocking them off balance. As in Sonic Riders, Cream doesn't feature in the Zero Gravity plot, but can be used in free races after unlocking her by finishing the Hero story. She has good dash and curve stats, and is once again a Fly Type rider. Cream wears her Ark of the Cosmos around her neck like a medallion. This short section needs expansion. You can help Sonic Retro by adding to it. Blaze the Cat finds Cream and Cheese hiding in a bush in Leaf Storm Zone near the beginning of the game, and is rather unwillingly dragged back to Vanilla's house for tea. Although both rabbits advise Blaze to seek out Sonic to help with the cat's Sol Emerald difficulties, she's determined to solve her problems on her own. Nonetheless, Cream tails Blaze around for the remainder of the game, until she's kidnapped by Robotnik and Eggman Nega before Point W and saved by the cat. On the plus side, Cream's incompetence serves to teach the Sol guardian the true meaning of friendship. At the very end of the game, after the Egg Salamander Nega is defeated and Blaze returns to the Sol dimension, Cream is consoled by Sonic. Along with E-123 Omega, Cream is one of two recruitable characters in Sonic Chronicles: The Dark Brotherhood who is not actually necessary to complete the game. Cream can be found in Green Hill Zone, where she's searching for a lost Cheese. Once the Chao is recovered, Cream joins the party. At high level, she proves the game's most powerful support character by far, enabling PP replenishment for repeated POW moves. Sonic and Tails run into Cream in Tropical Resort, while she's trying to fend off Orbot and Cubot, who have mistaken Cheese for a Wisp and are trying to capture it. When Tails questions what she's even doing in the Amazing Interstellar Amusement Park, Cream explains that she was out for a walk, and mistook the space elevator for a ride. Sonic encourages her to be more careful around machines. As Sonic completes more missions, Orbot and Cubot continue to mistake Chao for wisps. Cream ends up feeling sorry for the defeated robots, since Eggman apparently keeps sending them to bed without dinner. Cream does not appear in the Wii version of Sonic Colours. 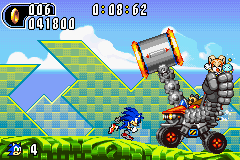 Once Speed Highway is completed by classic and modern Sonic, Cream and Cheese are unfrozen outside the stage. When the challenge gates appear for the Dreamcast-era levels, Cream has two missions to complete: in City Escape, she shepherds a cloud of Chao to assist Sonic by passing him rings during the level, while in Speed Highway there's a race between rabbit and hedgehog to see who can rescue the most of the blue creatures first. Cream was a playable Fly-type character in Sonic Runners who could be unlocked by spending Red Star Rings. Playing as her would cut game speed by 10%, but at the cost of cutting the player's score in half. This page was last edited on 9 April 2019, at 16:22.